I hope this email finds you well; excitement is building here in Festival HQ, as the deadline for entries for the 2018 Cork International Choral Festival is getting closer! The Cork International Choral Festival is held annually over five days, with next year’s dates being April 18th to April 22nd 2018. Cork welcomes choirs from across the world for a programme of Gala concerts, Choral Symposium, Schools Concerts, National and International Competitions, and world-class performances, as thousands of participants bring the city to life for a celebration of choral music in all its many forms. As well as international choirs, the Festival annually features up to 100 Adult, Youth and School choirs who participate in National Competitions. Overall the Festival attracts some 5,000 participants, performing to an audience of over 50,000 people over the 5-day duration. The Festival continues to ensure that choral music, representative of many historical and cultural traditions, is brought to the people of Cork and the many visitors who we are delighted to welcome to the city for the event. Each year some of the finest amateur international choirs are selected to compete for the prestigious Fleischmann International Trophy. The selected choirs also participate in a wide range of Festival events, which include Fringe concerts, taking part in our Choral and Sacred Trails programme across Cork city and county, which sees choirs popping up throughout Cork in new and unexpected locations throughout the duration of the Festival! Closing date for Non-Competitive entries is 30th November 2017. Please see attached syllabus with important information for the 2018 festival and the application forms for both Competitive and Non Competitive Participation. 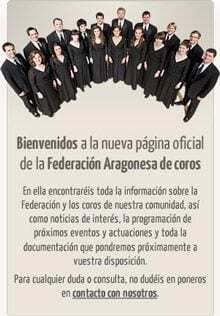 Further information can be found on Federación Aragonesa de Coros.